Eavis, who runs the annual music event with his daughter Emily, is concerned that because he does not own the whole site, land availability may become an issue further down the line. "I'm always worried about the future, about the land not being available, because I only own the middle bit," he told Sky News. "Where the Pyramid is and all the land around it is owned by other people, so that could be a problem long-term. I may have to find a site that's bigger and is all under the control of one person. That's the ideal situation, so that might happen in the long-term." Eavis is believed to be considering alternative sites but is not discussing details at this stage. "All good things come to an end and one has to make changes," he said. "I would love to stay but it's getting very, very complicated now." 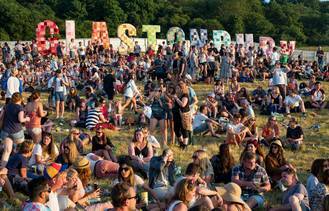 This year's Glastonbury kicks off on 24 June with Florence + The Machine, Kanye West and The Who headlining. Florence was drafted in as a last minute replacement for Foo Fighters, who were forced to pull out of their Friday night slot after frontman Dave Grohl broke his leg falling off stage in Sweden. Glastonbury began in 1970 when just a thousand people were given free milk with their tickets. More than 175,000 are expected to pass through the gates next week.